Born in Argentina and based in London, artist Amalia Pica explores metaphor, communication, and civic participation through drawings, sculptures, large-scale photographic prints, slide projections, live performances, and installations. The Museum of Contemporary Art Chicago exhibition Amalia Pica is the artist’s first major solo museum show in the United States and includes approximately fifteen of her most significant works from the last seven years, in addition to new commissions. Using simple materials such as photocopies, lightbulbs, drinking glasses, beer bottles, bunting, cardboard, and other found materials, Pica creates work that is formally beautiful and conceptually rigorous while addressing fundamental issues of communication—such as the acts of delivering and receiving messages (verbal or nonverbal) and the various forms these exchanges may take. 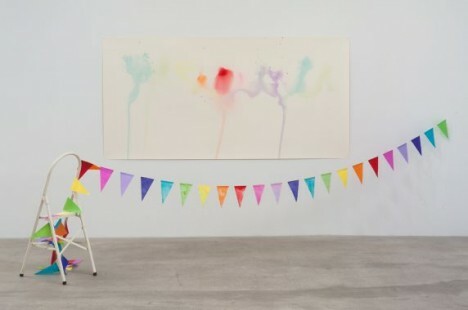 In addition to new work, the exhibition will include Strangers, an in-gallery performance in which two people who have never met before hold a bunting between them for a specific duration, and Grayscale, a crowd-sourced set of photographs of rainbows that have been reprinted as gray posters, which visitors are invited to take with them.